I've come across a lot of places providing help and contacts for those affected by the floods and those wishing to help or donate goods/supplies. I will keep adding as I come across them. Hopefully these are of some help to others out there. Thanks to all below who have proactively provided so much information and help. You all Rock! http://qldfloods.org/article/free-vaccinations-flood-effected-and-volunteers locations of free vaccination clinics in Brisbane. http://bakedrelief.org/ New site for all details on Baked Relief - baking food for the hard working volunteers. http://www.nationalstorage.com.au/ Offering pressure cleaners, generators & cleaning equipment for free, plus great discounts on storage. http://qldfloods.org/open-beds people who are willing to give their home to flood affected people. http://www.qcwa.org.au/ the Country Women's Association are helping out in their usual wonderful way. 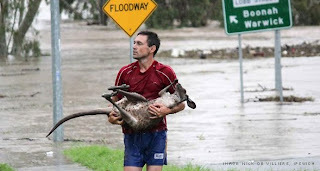 http://www.facebook.com/donations.for.qld.flood.victims?v=wall a good facebook page where you can list items you wish to donate & flood affected people can contact you. http://www.fridgesforfamilies.com.au/ you can donate money to purchase a refrigerator for a family who has lost theirs. Sponsored by Gold Coast Titans, Westpac & Harvey Norman. http://ebcc.com.au/content/ebcc-emergency-response-service-0 A community centre helping out local flood affected people. Still looking for cleaning products. They are helping people clean. http://www.basketsofhope.net/ A very practical way to help flood survivors. Put together a basket of goodies and drop off at one of the drop off points. Precise details of what is required for the basket on website. I personally love this. http://www.facebook.com/pages/5-x-5-Underwear-Drive-Qld-Flood-Appeal/186309524730046?v=app_4949752878&ref=mf a group of people organising a drive of NEW undies for flood survivors. I have also split these into categories to make it easier. http://www.facebook.com/pages/Adopt-a-Wash/101061533305273 Adopt a Wash are a group of ladies who will pick up flood affected washing, or any washing if someone is without a machine & do the washing. http://www.fisherpaykel.com.au/communitylaundry/ Fisher & Paykel have set up free laundries around Queensland to help flood survivors. http://www.flooddiscounts.com.au/ providing discounts with many types of businesses for flood affected people. http://www.facebook.com/RiverbendBooks Riverbend books offering to donate books to children who have lost their books. http://my247.me/sydney/list/known-list-of-places-currently-closed-due-to-the-2011-flood-disaster.1 2 lists - one of closed restaurants due to flood damage & one of restaurants that have reopened. You have been doing such a great job on twitter and this is a great blog post. I popped a link to it in my blog post. Hey, good job on this! Great list! Hannah's Foundation is also organising sponsors (and collecting nominees) for back to school book packs for flood affected school students. Well done! Thanks for sharing, it's well-written post!